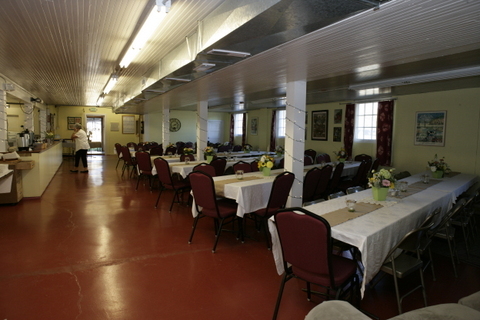 Rockford Grange Hall is available to rent for members and non-members alike. We offer a venue that can host a variety of events at an affordable rate. Private events like weddings, quinceaneras, classes and religious or spiritual gatherings are a few of the events we book regularly but if you don't see the type of event you'd like to host please contact us to see if Rockford Grange Hall is the place for you. Cost of rental is for daily use between the hours of 8AM to 10PM. A security deposit of $250 is required before booking. $225 of this deposit is refundable after the event and the Hall is left in the same condition as found. Additionally if cancellations occur greater than 30 days notice $225 is refundable, otherwise the security deposit is forfeited. Smoking is not permitted in the Hall but is permitted in the designated smoking area outside in the parking lot. Below is the layout of the basement eating and kitchen area. Did you know the average wedding ceremony venue costs $2,197 and the average reception venue costs $16,107? The Grange is a great affordable venue that can host both your ceremony and reception at a single low price. So save your money for what's important to you like life or the honeymoon. Our Ballroom on the upper level has a stage, wood dance floor and lots of room for entertaining. The Rockford Grange has a lower level dining area and full service kitchen area. The Rockford Grange Annual Fill Your Pantry Event is a great community based gathering of farmers and merchants to share and sell their bounty. Your daughter's quinceañera is a magical day for the whole family. We offer a venue that has space for a meal and dancing. Feel free to decorate the hall to make it special and customized to her unique personality. If you are looking to have a special dinner for a family gathering, a fundraiser banquet, or celebrating a retirement we have a perfect and affordable space for you to host your event. The Rockford Grange is perfect for hosting classes of all sorts. We have plenty of space for dance and exercise classes, a stage for theater classes, a kitchen for cooking classes and tables if you're lecturing or students need to be seated.